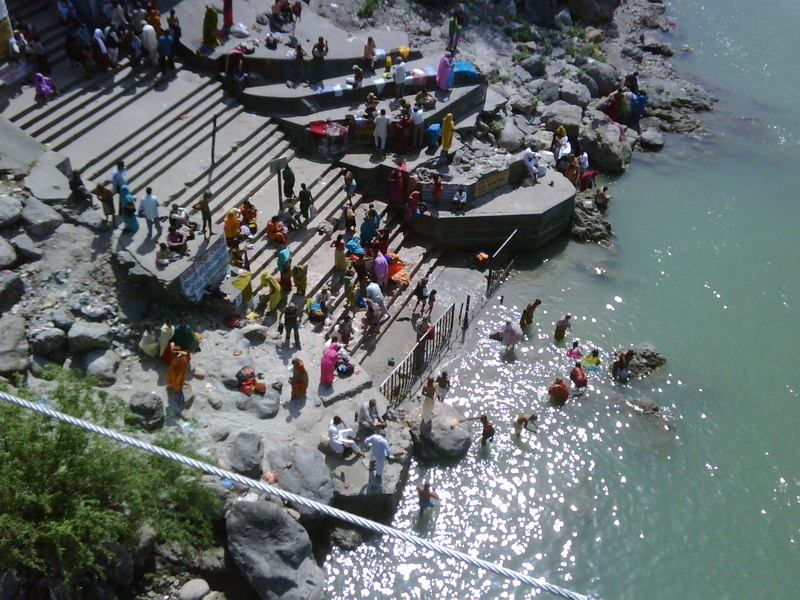 The holy city of hindus. Located in the foothills of the majestic Himalayas. A glimpse beyond the bag of bones. Passed many shaven pilgrims. I have a new vision of myself now. In this city of mystics, mendicants and seekers, my tonsured head blends in. 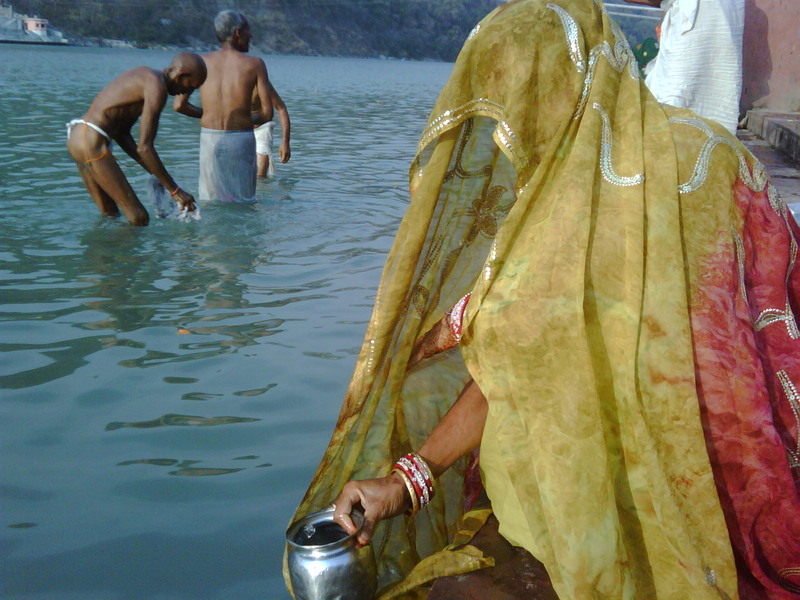 My dad and I sat by the side of the Ganges and dipped our fingers in the sacred river. He placed his hand on the crown of my head, leaving droplets in my pilgrim fuzz. We watched the faithful immerse themselves. Flashes of flesh, fabric flung away, a human ache meets the waters. The waters cleanse it all away. On the B side, Cooking with Stella will be releasing in Canada soon. Remember vinyl records? There was an A side and a B side. India right now feels like the A side of my life. The Indian Film Festival of Las Angeles has invited Cooking with Stella to be a Gala presentation during their festival (April 20-24). The festival would like the Gala presentation to also be a benefit screening to help raise awareness and support for the Myeloma Research Centre in California (http://www.imbcr.org/ ). We are very interested in educating Ms. Ray about the Institute for Myeloma and Bone Cancer Research in Los Angeles, California. Our offices, located near Beverly Hills on Sunset near Doheny house a comprehensive oncology clinic and state-of-the-art research laboratory. Our CEO and Founder, Dr. James R. Berenson is one of the leading physician/researchers in the field and has created many of the novel therapeutic drug compounds used by myeloma patients world-wide. The Institute works with most of the world’s largest pharmaceutical companies on testing and designing new myeloma drug therapies. Dr. Berenson is an international speaker on the subject and has published over 700 professional papers on the diagnosis, treatment and potential cure for myeloma. More information on Dr. Berenson can be found at www.berensononcology.com. The news of Ms. Ray’s continued improvement is certainly encouraging, and I understand that she’s currently seeing treatment at Juravinski Cancer Centre in Hamilton, ONT and not Los Angeles. I know that Dannielle and Brinda are located in Los Angeles, not far from our lab and offices. If Ms. Ray is ever in the Los Angeles area, we would delight in giving her a tour of our impressive facility, introduce her to Dr. Berenson (sought by myeloma patients world-wide for his second-opinion consults) and maybe… get her autograph! We are big fans! If Ms. Ray could kindly “link” our website, www.imbcr.org on her blog– we would certainly appreciate the exposure. If you or Ms. Ray have any questions, or would like to speak with Dr. Berenson regarding Ms. Ray’s treatment – please do not hesitate to contact me to arrange a consult. And here’s a must-read article about MMRF Founder and CEO Kathy Giusti. The article discusses in Kathy’s own words, her experience living with Multiple Myeloma, her advice for patients and families living with a diagnosis and describes the instrumental role Kathy’s pharmaceutical and business background has played in the MMRF’s success in advancing the next generation of treatment. Kathy was diagnosed at 37, just like myself. She is a Yellow Warrior. And my special Guru. I called Kathy a few months before, in the middle of a watery moment during chemo. As the liquid burned through my veins my mind turned to crisis. And then Kathy was on the line. She somehow placed her hand on my brow, from a distance. Just as I had sitting at dusk today, by the river with my father. Sometimes the world is so beautiful and so fierce I can feel my heart tear. I would like to be around for some time more. Bobcat just had knee surgery. With my seeking on the ‘A side’, and Bobcat healing ‘B side’, we maintain a strange symmetry. Still, I wish I was close. Please come back soon. No one does handstands on the beach with me anymore!! ah yes. I haven’t written on Goa yet because I’m trying to formulate a way to do it without reference to exact location. My friends are adamant of protecting the privacy of their favourite resort. Time is coming to flow down from a higher place to sea.